Snow is probably the most well known type of winter precipitation. There are, however, several other forms in which precipitation can fall during the cold winter months. It all depends on the temperature profile of the lower atmosphere. All precipitation starts out as snow up in the clouds. But, as it falls toward the Earth, it can pass through one or more layers of air with different temperatures. When the snow passes through a thick layer of warm air – above 32°F – it melts into rain. If the warm air layer extends all the way to the ground, rain will fall at the surface. However, if there is a thin layer of cold air – below 32°F – near the ground, the rain becomes super-cooled and freezes upon impact with anything that has a temperature of at or below freezing. This is known as freezing rain. It is one of the most dangerous types of winter precipitation, as it forms a glaze of ice on almost everything it comes in contact with, including roads, tree branches, and power lines. 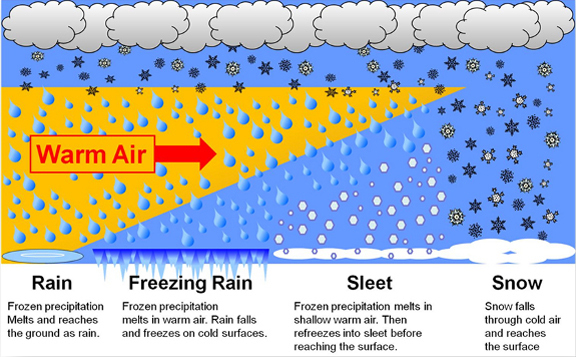 Sleet is different than freezing rain – it is a frozen precipitation. It falls at ground level in the form of ice-pellets. Passing through a thick layer of sub-freezing air near the surface, liquid raindrops are given enough time to re-freeze before reaching the ground. Sleet often bounces when it hits a surface, but does not stick to any objects. It can, however, accumulate. Snow is another type of frozen precipitation. It takes the shape of multi-sided ice crystals, often called flakes. Snow will fall at the surface when air temperatures are below freezing all the way from the cloud-level down to the ground. In order for the snow to stick and accumulate, surface temperatures must also be at or below freezing. When all of these precipitation types fall during a single storm, it is called a wintry mix. Precipitation type depends on the temperature profile of the atmosphere. Wind chill is a measure of the apparent or “real feel” temperature. It calculates the heat loss from exposed human skin through the combined effects of air temperature and wind speed. Essentially, the wind is carrying heat away from the body and allowing the skin to be exposed to cold air. As the winds increase, heat is carried away at a faster rate and the colder the body feels. For example, a temperature of 20°F and a wind speed of 5-mph will produce a wind chill index of 13°F. At that same temperature, but with a wind speed of 10-mph, the wind chill index would be 9°F. Extended exposure to low wind chill values can lead to frostbite, a serious winter health hazard. After a mild start to the season, winter has finally found New York City. A deep dip in the jet stream has ushered in bitterly cold arctic air and brought the city its coldest temperatures of the season to date. While we are in the dead of winter and cold temperatures are expected, today’s high was only 20°F. That is 18°F below average. In fact, today was the coldest day NYC has experienced in two years. These frigid conditions, according to the local forecast, are likely to stay in place for a while. Temperatures are not expected to get above the freezing mark until early next week. Bundle up! Today marks the beginning of the “Dead of Winter”. This old saying refers to the coldest, and often the harshest part, of the winter season. Traditionally, this period runs from January 10th through February 10th in the northern hemisphere. The “Dead of Winter” is the climatological opposite of the “Dog Days of Summer“. It is summer in Australia and it is hot! 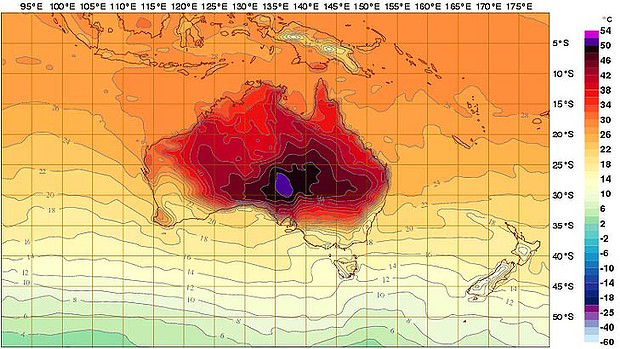 Facing unprecedented heat, the Australian Bureau of Meteorology has added two new temperature categories – with corresponding colors – to their forecast map. Previously capped at 50°C (122°F), the new map can represent readings up to 54°C (129.2°F). Deep purple and hot pink will now indicate areas experiencing these new temperature ranges. While Australia’s all time record high of 50.7°C (123.3°F), set on January 2,1960 in South Australia, currently still stands, this revised map anticipates a new record high. For many, it also reflects a new climate reality. 2012: Warmest Year on Record for U.S.
Its official! 2012 was the warmest year on record for the contiguous United States. According to the National Climatic Data Center, the average temperature for the country was 55.3°F, which is 3.2°F above the long-term norm. It is also a full 1°F above the old record set in 1998. While a single degree may not sound like much, it is actually a large departure. Records usually only differ by a tenth of a degree. As hot as it was last year, this new record does not come as much of a surprise. 2012 brought the United States a record warm spring in addition to its fourth warmest winter, third warmest summer, and an above average autumn. In terms of precipitation, 2012 was the 15th driest year on record in this country. The average precipitation total for the lower forty-eight states was 26.57 inches, which is 2.57 below normal. This lack of rain brought on the worst drought this nation has seen in more than fifty years. The dry conditions, in turn, helped fuel a destructive wildfire season. More than nine million acres were charred nationwide this year – the third largest area on record. While high temperatures and low precipitation dominated, 2012 was also a year of severe weather. According to the US Climate Extremes Index, 2012 was the second most extreme year on record for this country. As a whole, the nation experienced eleven natural disasters that each caused at least one billion dollars worth of damage. These events included hurricanes Sandy and Isaac as well as several tornado outbreaks in the south and mid-west. What a year! December 2012 was unusually warm and wet in New York City. With nineteen out of thirty-one days posting warmer than normal readings, the city’s average monthly temperature reached 41.5°F, which is 3.5°F above normal. On the precipitation side of things, the city collected 4.80 inches of rain, which is 0.8 inches above average. This is only the third time this year that NYC received normal to above normal monthly rainfall. In terms of snow this December, we saw 0.4 inches accumulate in Central Park – all of which fell as part of a wintry mix during the nor’easter on the day after Christmas. This meager snowfall total is 4.4 inches below the city’s long-term norm for the month.